Update on Trips | Nam Writes. Definitely an on-the-go trekking holiday through Andalucía – though I´m biased! Hi! I know this post is from a while back, but I’m curious to know if you’ve done this trip. My girlfriend and I booked a week (12/31 – 1/7) in Spain. 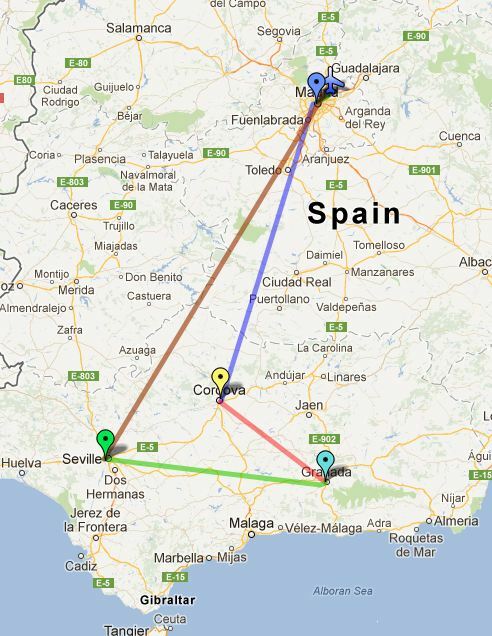 We’re flying into Madrid and are looking to do a very similar itinerary. Was this too much in a week? I’m not sure if I should try to see all 4 cities or just keep it to 3 (1 1/2 days in each city). ANY insight would be incredibly appreciated. Thanks!! Hi Matt, I have not made it to Spain yet so I have no experience to speak from. My only advice is that it depends on how you like to travel – if you mind hopping from one city to the next every day or so. I get a little tired and like to take my time. I’d also mention that Toledo (just south of Madrid) is often mentioned as worthwhile, and some people really don’t love Madrid. Let me know how it goes!